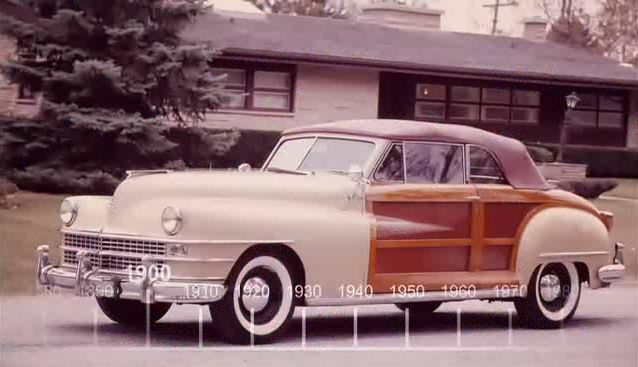 IMCDb.org: 1946 Chrysler Town & Country [C-39] in "The Big Bang Theory, 2007-2019"
Chrysler Town and Country convertible 1946-48. Looks to be the same as /vehicle_44084-Chrysler-Town-and-Country-1947.html . In 1946 1 six-cylinder prototype and 1935 V8 convertibles were built, in 1947 3136 convertibles, in 1948/1949 first series 3309 convertibles. Assuming that this is not the prototype, the chassis code is [C-39]. I guess the other similar T&Cs (also /vehicle_133977-Chrysler-Town-and-Country-1947.html and maybe /vehicle_25018-Chrysler-Town-and-Counrty-1947.html ) that are listed as 1947 model should get 1946 as date, since I don't think there were any changes during these years. OOops, DynaMike. Those were not V8 engines. They were straight eight engines. Pictures are property of movie companies owner of the respective movies. Comments are property of their authors. Page generated in 0.013 sec.